Glass Slippers - be careful not to drop them. Slippers are light shoes which are easy for the owner to put on and take off. Some slippers are for casual indoor use, and others are made for formal events such as the prom, weddings, or a royal ball. Glass slippers are slippers that are manufacturerd with glass. The glass variety of slipper typically fits their owner like a glove. Almost as if they are made to be "one of a kind" for a particular person and not to be worn by another. Glass is a non-crystalline amorphous solid that is often transparent and has widespread practical, technological, and decorative usage in, for example, window panes, tableware, and optoelectronics and slippers. Scientifically, the term "glass" is often defined in a broader sense, encompassing every solid that possesses a non-crystalline (that is, amorphous) structure at the atomic scale and that exhibits a glass transition when heated towards the liquid state. 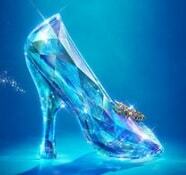 What is the most famous glass slipper? Once upon a time, there was a wealthy widower with a beautiful & kind daughter named Cinderella (Ella). The father married a proud and haughty woman as his second wife. She had two daughters, who were equally vain and selfish. They wanted to be fashionistas, but were simply to mean to properly achieve this goal. The father dies, and the man's sweet daughter is forced into servitude. Here comes the royal ball but Cinderalla is swamped by chores and has nothing to wear. A Fairy Godmother shows up and turns Cinderella's rags into a beautiful jeweled gown, complete with a delicate pair of glass slippers. The Godmother told her to enjoy the ball, but warned that she had to return before midnight, when the spells would be broken. At the royal ball, the Prince had become infatuated, and Cinderella in turn became so enchanted by him she lost track of time and left only at the final stroke of midnight. As she bolts off, she loses one of her glass slippers on the steps of the palace in her haste. The Prince chased her, but she was way to fast. The Prince pocketed the slipper and vowed to find and marry the girl to whom it belonged. Meanwhile, Cinderella kept the other slipper, which did not disappear when the spell was broken. The Prince tried the slipper on all the women in the kingdom. When the Prince finally arrives at Cinderella's home, the stepsisters tried in vain to win over the prince. After busting out of her locked room, Cinderella gets to try on the glass slipper. Naturally, the slipper fit perfectly. The prince and Cinderella lived happily ever after. Some have magical properties but others do not. Unfortunately, some are not authentic and therefore are missing the magic. Where are glass slippers made? 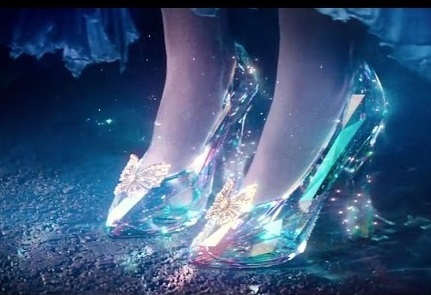 Some glass slippers are made in China at shoe factories and others are made by Fairy God Mother's in many countries around the globe (including in China). Cinderella, or The Little Glass Slipper, (French: Cendrillon, ou La petite Pantoufle de Verre, Italian: Cenerentola, German: Aschenputtel) is a folk tale embodying a myth-element of unjust oppression/triumphant reward. Thousands of variants are known throughout the world. The title character is a young woman living in unfortunate circumstances, that are suddenly changed to remarkable fortune. The oldest documented version comes from China, and the oldest European version from Italy. The most popular version was first published by Charles Perrault in Histoires ou contes du temps passé in 1697, and later by the Brothers Grimm in their folk tale collection Grimms' Fairy Tales. 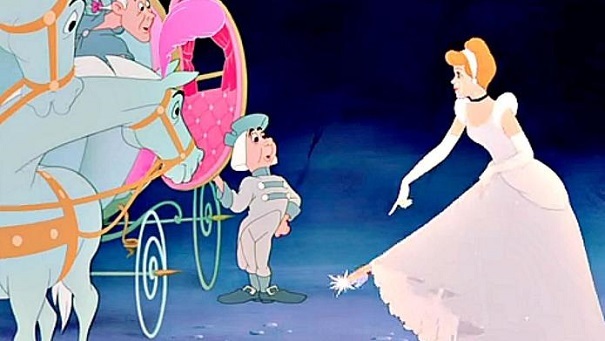 Although the story's title and main character's name change in different languages, in English-language folklore "Cinderella" is the archetypal name. From China, Ye Xian which is one of the oldest known variants of Cinderella, appeared in Miscellaneous Morsels from Youyang by Duan Chengshi around 860. Here, the hardworking and lovely girl befriends a fish, the reincarnation of her mother, who was killed by her stepmother and sister. Ye Xian saves the bones, which are magic, and they help her dress appropriately for the New Year Festival. When she loses her slipper after being recognized by her stepfamily, the king finds her slipper and falls in love with her (eventually rescuing her from her cruel stepmother). The first written European version of the story was published in Napoli (Naples) by Giambattista Basile, in his Pentamerone (1634). The story itself was based in the Kingdom of Naples, at that time the most important political and cultural center of Southern Italy and among the most influential capitals in Europe, and written in the Neapolitan dialect. It was later retold, along with other Basile tales, by Charles Perrault in Histoires ou contes du temps passé (1697), and by the Brothers Grimm in their folk tale collection Grimms' Fairy Tales (1812). The name "Cenerentola" comes from the Italian word "cenere" – tchenere (ash – cinder). It has to do with the fact that servants and scullions were usually soiled with ash at that time, because of their cleaning work and also because they had to live in cold basements so they usually tried to get warm by sitting close to the fireplace. One of the most popular versions of Cinderella was written in French by Charles Perrault in 1697, under the name Cendrillon. The popularity of his tale was due to his additions to the story, including the pumpkin, the fairy-godmother and the introduction of "glass" (a translation error must have occurred when the story was translated from French into English, as it is argued that in the earliest printed French version it was a "pantoufle de vair", which is the old name for grey squirrel fur and not a "pantoufle de verre" which would be glass) slippers. Where are Cinderellas slippers now? Most likely, in her shoe closet. You may also be interested in learning about ruby slippers. By the way, the rock band Cinderella is completely different. As far as we know, they don't wear glass slippers. If you are looking for rock band fashion, you may want to check the band t-shirt page.